Tucked away in the Eulalia valley, this farmhouse style villa oozes charm and character, and is the perfect retreat for nature lovers and escapists! Beamed ceilings, cosy alcoves, and cool spacious rooms abound inside, and a kaleidoscope of colours can be enjoyed through all windows into the surrounding gardens. The delightful gardens and pool area offer endless opportunities for dining "al fresco" as you enjoy the peace and tranquility of nature at its best! Perfect property to unwind in privacy and enjoy traditional Ibicenco style and hospitality! This fantastic villa is also fully enclosed. 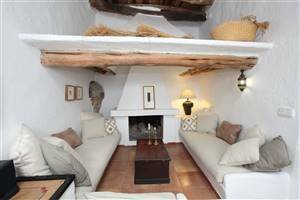 Enviable tranquil location set in picturesque and serene Ibicenco countryside. Just a 10 minute scenic drive to Ibiza Town for its old town charms and people watching, and 7 minutes to Santa Eulalia with its yachting marina, cosmopolitan pavement cafes and restaurants in the opposite direction.The choice is yours! Annex has two twin bedrooms and and a separate Double bedroom studio, each with own separate entrances for total privacy if required from Main House. Pool of approximately 12 x 5 m at back of house in gardens. The rental period is variable for stays over 1 week, Check in 14.00 on the day of arrival through to 10.00 am on departure day, this is necessary to allow for cleaning and preparation for arrivals. Linen provided Maid service once a week. Out of season rentals available, prices on request.